The Senate Minority Leader, Godswill Akpabio, on Sunday visited President Muhammadu Buhari in London. 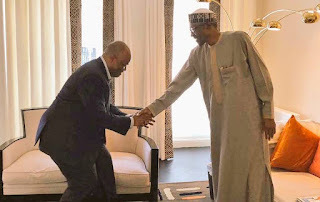 The meeting came at a time there are reports that the former Akwa Ibom State Governor will be defecting from the Peoples Democratic Party to the ruling All Progressives Congress this week. The Head of Digital Communication of the Presidency, Tolu Ogunlesi, confirmed the meeting between the President and Akpabio in London on Sunday on his Tweeter handle, @toluogunlesi. He attached photographs of the meeting between the two leaders. Buhari is currently on a 10 - working day vacation. Presidential spokesman, Femi Adesina, had issued a statement that Buhari would be in London, United Kingdom, throughout the vacation period.